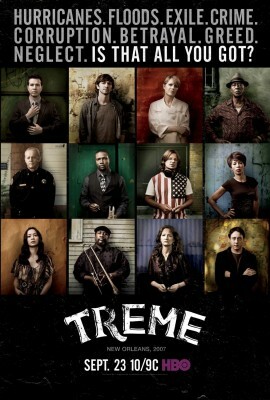 Created by David Simon and Eric Overmyer, Treme has never been a ratings success. Will this be the year that HBO finally cancels it or perhaps when it starts attracting a big audience? We’ll have to wait and see. Set in New Orleans, the large cast includes Khandi Alexander, Rob Brown, Kim Dickens, India Ennenga, John Goodman, Michiel Huisman, Melissa Leo, Lucia Micarelli, David Morse, Clarke Peters, Wendell Pierce, Jon Seda, and Steve Zahn. Below are the most recent ratings for Treme on HBO. The third season airs on Sunday nights and there are 10 episodes this time. Final season averages: 0.2 rating in the 18-49 demographic with 0.53 million total viewers. 0.1 demo rating (-50% change) with 0.47 million (-20% change). Season averages: 0.18 in the demo with 0.53 million. 0.2 demo rating (0% change) with 0.59 million (+19% change). Season averages: 0.18 in the demo with 0.54 million. 0.2 demo rating (0% change) with 0.50 million (-11% change). 0.2 demo rating (0% change) with 0.56 million (+14% change). 0.2 demo rating (0% change) with 0.49 million (-18% change). 0.2 demo rating (0% change) with 0.60 million (+15% change). Season averages: 0.17 in the demo with 0.54 million. 0.2 demo rating (0% change) with 0.52 million (+8% change). Season averages: 0.17 in the demo with 0.53 million. 0.2 demo rating (+100% change) with 0.48 million (-10% change). Season averages: 0.15 in the demo with 0.53 million. 0.1 demo rating (-50% change) with 0.54 million (-5% change). Season averages: 0.15 in the demo with 0.55 million. UPDATE: The series has been renewed for a fourth and final season of five episodes. 0.2 rating in the 18-49 demographic with 0.59 million total viewers. Season average: 0.2 in the demo with 0.59 million. Reference point: The second season of Treme averaged a 0.2 rating in the demographic with 0.57 million viewers. What do you think? Do you still like the Treme TV series? Do you think the show should be cancelled or renewed for a fourth season?